I cannot pretend that it is still summer. I have to do a few things to trick myself into getting excited about a season which will eventually bring me gray, cold days. I plan silly Halloween outfits for our family and scour the local thrift shops looking for the parts and pieces. Last year all of us were Peter Pan, Captain Hook, Wendy, Tinkerbell, and Tick Tock the alligator. This year is in the works. You'll have to wait on the reveal. I work on Christmasy cards and projects. Papertrey Ink's October release is coming up on the 15th and the PTI designers are all banding together today to bring you some wintery inspiration! I was really drawn to the "snowflakes sparkle and tree tops glisten" sentiment. 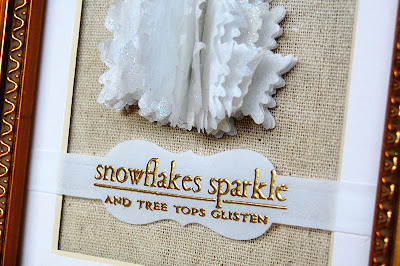 It brought to mind sparkly, full trees... and seeing them all in white like from the ski lift I ride on every year (you know... during the 4 days a year when I appreciate the cold and snow). I wanted to bring that tree to life, so I went with a 3D tree. I started by using the coordinating In the Meadow tree die to die-cut a stack of tissue paper. I used about 10 sheets and cut them all at once. In order to add the sparkle to my tree, I cut a few extra trees and full-on glitterfied them :) A little coating of spray adesive does the trick with fragile tissue paper. Each one got a little dip in a pile of glitter and came out looking quite sparkly and happy. The stack of layers found a new home in a pretty frame with a white mat. I covered the backing portion of the frame with a simple linen panel (put that spray adhesive to use again there) and used Scortape to stick the tree right on. The sentiment has it's own little spot on a Photo Finishers die cut. Each one is bringing you more of In the Meadow. 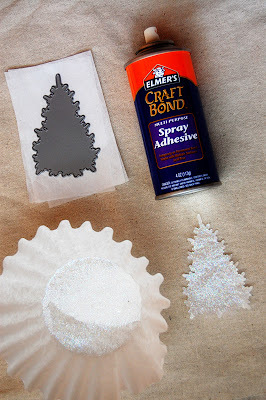 Any other perfectly Christmasy crafting time tips to get me in the winter crafting mood?? Jessica, this tree is exquisite! Love the sparkly layers! Awesome! Incredible! Where did you get that frame please? 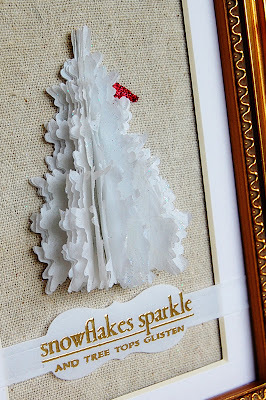 Wow, what a FAB idea to cut the multi layers of tissue paper...I can see possibilities for that idea with many different dies...this decor piece is lovely! 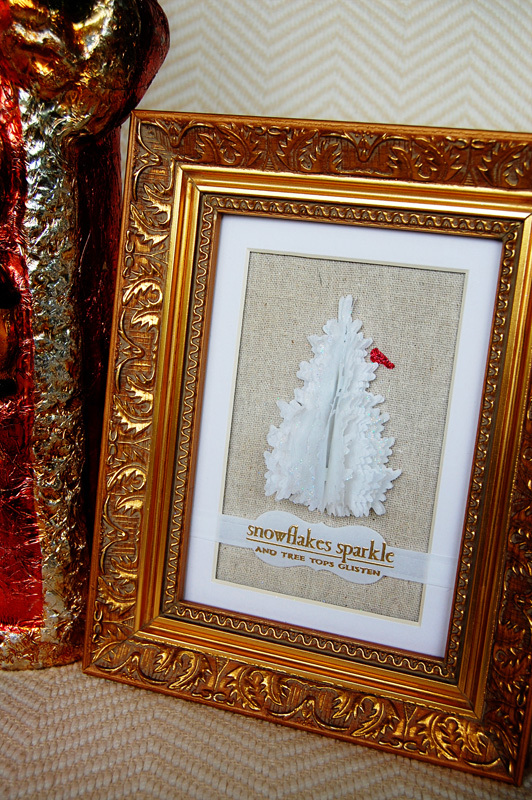 Jess, your sparkly tree looks fabulous on the frame. The gold-embossed sentiment is the ideal sentiment. Am in love with the In The Meadow set & dies and haven't seen it all yet. Off to see more…on other blogs! SO beautiful! 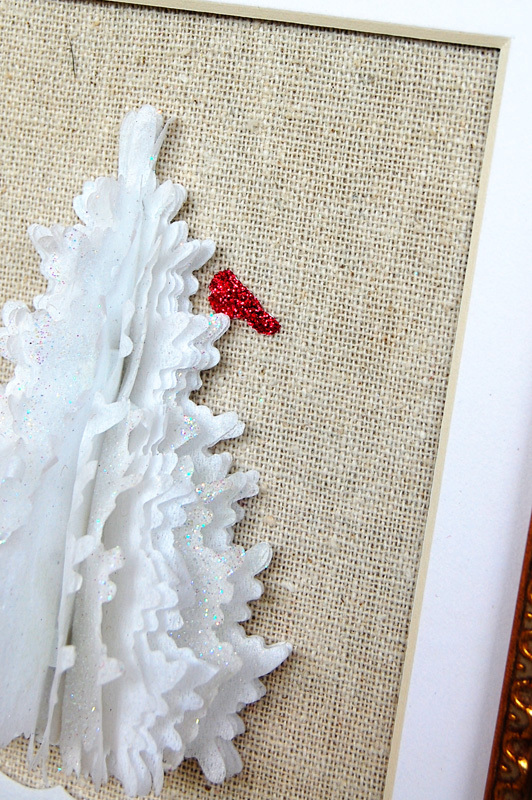 Love your tree and that little red bird! What a wonderful decorative piece of art! Oh, wauw!! What an amazing idea to use this and make this 3D tree!! It looks absolutely perfect!!! Soooo gorgeous!!!! Simply a wonderful creation! Super duper! What a fabulous project! I just love it! Thanks for sharing. Tardigans - I totally lol at this. Love your project. So classy. This could not be prettier! Just love it!! 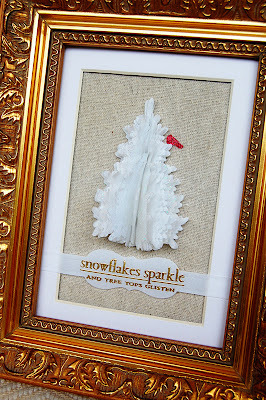 I love to see ones craft used in home decor and you've done a wonderful job with this piece. Love the tissue paper idea, Jess!! Your beautifully framed tree is a work of art! I used to make holiday-themed cross-stitch "pictures" and now I see that I can frame some card designs and not have to worry about the bulkiness of added bling (cuz I will display them at home instead of mailing them). Thx much for your ongoing inspiration! This is so absolutely darling! I'm bookmarking for gifts. I have two sets of newlyweds that would enjoy some Christmas decorations. And so easy to do. Thanks for the great idea! Thanks for the inspiration! I ran with it!